As the tournament director, Markus Günthardt feels bound by the big Porsche tradition – which does not hinder him from regularly introducing new ideas. And he was more than happy to answer the question as to what was the Grand Prix going to look like in ten years? Günthardt let his fantasy run wild – as proved by his look into the future. What fascinates people about sport? I think it’s in part down to the fans feeling at ease in accustomed surroundings. 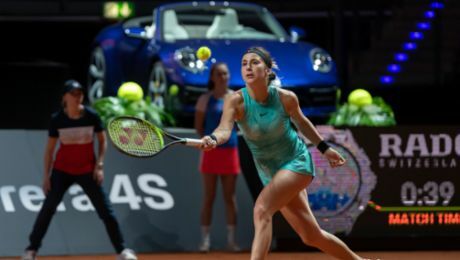 At the Porsche Tennis Grand Prix, we welcome the world’s top players year after year, we have our home in the Porsche Arena, the Sport & Lifestyle Village and Court One are always in the same place, one meets up with people with the same interests. Much-loved fixed points that find favour amongst spectators. But it is also the unexpected that attracts them to the arena. A fantastic rally, a surprising turnaround in a match, a sensation or a deep disappointment. The mixture of accustomed comfort and the incalculable provides the kick. We as organisers can increase the attractivity of the tournament by making the packaging always a touch more refined. Year for year, we tweak the adjustable screws to extract the optimum. And when I think how the fantastic Grand Prix will look like in ten years, I’m quite sure it’ll be hardly recognisable. It starts with the players’ clothes. What today is still functional with fashionable chic will be transformed into an eye-catching extravagance that may distract from the tennis. Decisive will however be the technical complexity. The clothing is completely networked and can always be increasingly adjusted individually to the respective player. The major brands will face competition from little start-up companies forcing their way on to the market with their collections – the opportunities are almost boundless. The players will carry minute cameras all over their bodies – from the head via the clothing right down to the shoes. From the net to the perimeter advertising, the court is full of micro cameras. Hovering over the court are mini-drones for different camera angles. One can follow the match from the umpire’s viewpoint and test one’s own refereeing qualities. Perhaps there’s even robots acting as court officials as their concentration doesn’t wane after three hours. Viewers at home can play director and, thanks to the multitude of cameras, watch the match if preferred from every imaginable perspective and switch backwards and forwards. A fantastic rally, an ace – the viewer decides what he wants to enjoy once again in super slow motion. And those who have always wanted to pit themselves against a pro, they can play the match against their favourite player – at home with VR glasses and controller. Even courtside, the spectators will stare at their smartphones or wear VR glasses because they are offered valuable added value. During the match, the audience can call up statistics, facts about the players or the speed of the smash just played. A personalised tennis experience on-site. The supporting programme of events also shines in personalised lustre. After all, the audience in Stuttgart has always been spoilt when it comes to entertainment. The shows are accordingly more spectacular and utilise the latest technology. Here too the spectators are involved – the course of a show number can be determined on site. Those not satisfied with the alternative end can watch another digitally. Staying “off-court” – for some spectators the wealth of entertainment will be too much and they will yearn for a spot of peace and quiet in between. Everything rushes by and one is entertained and supplied with information from all sides. It’s why there are oases of tranquillity in the Porsche Arena where people can relax totally offline. Afterwards, they can go back to enjoying the accustomed comfort, the fantastic rallies, the surprising turnarounds, the sensation. The Swiss was born in Zürich on 10 September 1957. 1978–1985 Tennis pro on the ATP-Tour and Swiss Davis Cup player. As a doubles specialist, he was ranked No. 40 on the doubles world rankings. 1990–1999 at the Tiriac group, director of various tennis tournaments including the Eurocard Open in Stuttgart, Tennis Masters in Stuttgart and Madrid. 2003 Built up the Vision Sports & Events sports marketing agency in Spain. Since 2005, Tournament Director of the Porsche Tennis Grand Prix. Lives with his family in Madrid and Switzerland. Seeing the world with different eyes: very easy using virtual reality (VR) glasses. They enable the perception of another reality. A forward-looking view into the future using the virtual reality glasses is possible this year in the Porsche Kids’ World. On two Porsche Racing Simulators, the virtual Porsche motorsport world can be experienced interactively. Text first published in Porsche Tennis Magazine 2017. The unbeatable team in the Porsche Tennis Grand Prix: Anke Huber and Markus Günthardt.